A loan of $250 helped to buy more fruits. Peninah is a fifty-four-year-old widowed woman. She has five children whose ages range from twenty to thirty-four. She describes herself as diligent. 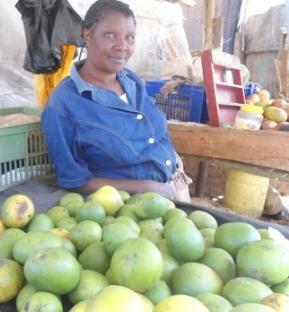 She operates a grocery store where she sells fruits such as mangoes etc. Her business is located within a fast growing slum area and her primary customers are local residents. She describes her biggest business challenge as being insufficient funds for improving the business. She will use the KES 20,000 loan to buy more fruits. Her business goal is to be a supplier of fruits within 5 years. She hopes that in the future, she will own a plot and build rental houses .